Our Goal: End bullying through Kindness. 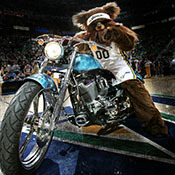 The Utah Jazz Bear’s children were being bullied at school. Because the school staff had no resources to provide assistance, The Bear went to Stan Parrish, President of Sandy Area Commission and Gail Miller for help, and UABC was born. The Utah Anti-Bullying Coalition provides, a teaching kick-off assembly, anonymous text or call tip line, training for students, parents, school staff and sets up student lead Ambassador Clubs which create competitions to promote kindness in the school. As part of our assembly, students are asked to stand for kind, and challenged to do acts of kindness daily. Post assembly, training is available to staff, students, parents and bus drivers. Student Ambassador Clubs are set up to teach and promote leadership. Kids create monthly contests with kindness challenges and goals, sharing pictures and videos of their events (acts of kindness), on stand4kind.com . Prizes are given to students for kind deeds. Currently we have 425 schools waiting……. Join with us, we need your help!